The DCF SP series of binoculars, including the award-winning 10x50 DCF SP, has all the quality features you’d find in higher-priced European models at a fraction of the cost. The exceptional image quality and edge-edge sharpness comes from a long list of outstanding features including an inner-focus optical design incorporating hybrid aspherical eyepiece lenses, high-resolution phase-coated roof prisms, hydrophobic coating on exposed objective and eyepiece lenses, and multi-coated optical elements. Coupled with a magnesium-alloy body with JIS Class 6 waterproof construction, these high-performance models are the only choice for discerning users with uncompromising standards. Perfect for a wide variety of applications such as close-up viewing and use in less-than-ideal weather conditions. The award-winning PENTAX 10x50 DCF SP binocular has all the quality features you’d find in higher-priced European models at a fraction of the cost. With exceptional image quality and edge-edge sharpness that comes from a long list of outstanding features, the high-performance PENTAX 10x50 DCF SP binocular is the only choice for discerning users with uncompromising standards. 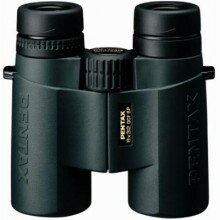 Click the button below to add the Pentax DCF SP 10x50 Binoculars to your wish list.